We’d love your help. Let us know what’s wrong with this preview of The Domesticated Brain by Bruce M. Hood. How does the brain influence our behaviour? The brain may have initially evolved to cope with a threatening world of beasts, limited food and adverse weather, but we now use it to navigate an equally unpredictable social landscape. In The Domesticated Brain, renowned psychologist Bruce Hood explores the relations What makes us social animals? To ask other readers questions about The Domesticated Brain, please sign up. Kitabı beğendim, kesinlikle boş bir kitap değil. Genelde bu tip popüler bilim kitaplarında pek dipnot kaynakça göremezsiniz ama bu kitap cömert bir kaynakçaya sahip. Kitapta en çok beğendiğim bölüm rutin kişisel ilişkilerimizin beyindeki kaynaklarına odaklanmış son bölüm oldu. Bu bölüm sayesinde yalan, kendini kandırma, aldatma, dedikodu gibi unsurların beyindeki temelleri üzerine önemli fikirler edindim. Yaşantılamışızdır; kim olmaklığımız; duyumsallarız... kendimizi iyi duyumsamamız gerekir ama niye iyi hissetmemiz gerekir değil?? Fairly interesting but nothing groundbreaking. Seen a lot of the stuff described in other places. Some nice evo/psych but its been done before. It seems that the domestication produces a reduction in the brain in terms of mass, ie it shrinks and this goes for both men and animals, although in our case we prefer to speak of "ability to live in society more or less extended" . Clearly socialization brings with it the ability of communication and is therefore the researcher's idea that our brain has evolved to be "social", which implies thus the ability to feel various emotions and to empathize and this would also explain the really except It seems that the domestication produces a reduction in the brain in terms of mass, ie it shrinks and this goes for both men and animals, although in our case we prefer to speak of "ability to live in society more or less extended" . Clearly socialization brings with it the ability of communication and is therefore the researcher's idea that our brain has evolved to be "social", which implies thus the ability to feel various emotions and to empathize and this would also explain the really exceptional lasting time, compared to that of other animals, of our childhood. It is during childhood that we learn to understand others and especially to control ourselves and our reactions, because this is a prerequisite for living in a society. Sembra che l'addomesticamento produca una riduzioni del cervello in termini di massa, cioé si rimpicciolisce e questo vale sia per gli uomini che per gli animali, anche se nel nostro caso si preferisce parlare di "capacitá di vivere in societá piú o meno allargate". Chiaramente la socializzazione porta con sé la capacitá di comunicazione ed é quindi idea del ricercatore che il nostro cervello si sia evoluto per "essere sociale", il che comporta quindi anche la capacitá di empatizzare e di provare emozioni varie e questo spiegherebbe anche la durata veramente eccezionale paragonata a quella degli altri animali, della nostra infanzia. È proprio durante l'infanzia che impariamo a comprendere gli altri e soprattutto a controllare noi stessi e le nostre reazioni, proprio perché questa é una conditio sine qua per vivere in una societá. Why do we need brains? Your first thought must be that we need brains to stay alive. But we also need other organs to stay alive. Hood opens The Domesticated Brain with various intriguing thoughts, even for someone who has taken an introductory psychology course. Nonetheless, as the book goes on, much of the content seems to be an aggregation of past knowledge. In other words, it would be a great book if you're looking for an introduction to humans as social animals and why we behave in certain Why do we need brains? Your first thought must be that we need brains to stay alive. But we also need other organs to stay alive. Hood opens The Domesticated Brain with various intriguing thoughts, even for someone who has taken an introductory psychology course. Nonetheless, as the book goes on, much of the content seems to be an aggregation of past knowledge. In other words, it would be a great book if you're looking for an introduction to humans as social animals and why we behave in certain ways. Hood touches on a variety of subjects, from psychology to biology, allowing the reader to better understand human behaviour. However, he focuses mainly on developmental psychology and children (well, he is a developmental psychologist after all) but perhaps touching more on adults would be more useful to the general reader. Because of the wide variety of topics he touches on, I feel that the content seems to jump here and there, with a weak theme within each chapter, with the except of the last chapter. Regardless, it was a pretty good introduction to psychology and human behaviour which also touches on epigenetics. Many of the "must-know" famous psychology studies are used as examples and a lot of his claims are cited with studies to back them up. Overall, it was a great read. This is one of the best books in the field of Psychology. I enjoyed reading this tremendously and it is a refresher to my rusty knowledge about Psych as it has been a few years since I was minor-ed in Psych at school lol. Having said that, people who are new to the field of Psychology should give this a go because the concepts are easy to comprehend. Hood has also provided a plethora of examples, which made the reading all the more enjoyable and fascinating. Thumbs-up! This is a fun read on the evolution of the human brain and, most importantly, social behaviour. The author recites an abundance of research findings and proven behavioral biases, although, to his credit, he refrains from admitting closure for topics that still evoke contradictory interpretations. This book does not serve as a mere encyclopedia of facts to be regurgitated during dinner parties; it immerses the reader in the uncomfortable sea of the (relatively) nascent area of behavioral neurosci This is a fun read on the evolution of the human brain and, most importantly, social behaviour. The author recites an abundance of research findings and proven behavioral biases, although, to his credit, he refrains from admitting closure for topics that still evoke contradictory interpretations. This book does not serve as a mere encyclopedia of facts to be regurgitated during dinner parties; it immerses the reader in the uncomfortable sea of the (relatively) nascent area of behavioral neuroscience, reminding one that any material finding is only an intermediary step towards the next discovery and never the final stop. The reader will identify with several studies explaining (and therefore predicting) social behavior; the experience of understanding the limitations of uniqueness is sanguinely humbling. Bruce Hood yazmış bir kitap, aslına bakılırsa ne akar, ne kokar, orta hallice. Ama çevirmen işi resmen batırmış. TDK ‘ya uygun çevireyim diye uğraşırken pek çok yerde “ne diyor bu yahu !” diye düşünüyorsunuz. Örnek vermek gerekirse: kıtkısal, sığa, edim, oydaşma, görüngü, ilkinki, ulam, tözcü, tepke... gibi günlük hayatta kullanılmayan bir sürü kelime mevcut. Kitabın bütünlüğüne ve anlaşılmasına zarar vermiş açıkçası. Kitabı çok fazla beyin üzerine kitap okumuş biri olarak vasat bulduğumu belirtm Bruce Hood yazmış bir kitap, aslına bakılırsa ne akar, ne kokar, orta hallice. Ama çevirmen işi resmen batırmış. TDK ‘ya uygun çevireyim diye uğraşırken pek çok yerde “ne diyor bu yahu !” diye düşünüyorsunuz. Örnek vermek gerekirse: kıtkısal, sığa, edim, oydaşma, görüngü, ilkinki, ulam, tözcü, tepke... gibi günlük hayatta kullanılmayan bir sürü kelime mevcut. Kitabın bütünlüğüne ve anlaşılmasına zarar vermiş açıkçası. I borrowed this book from a friend who is working on a PhD in neuroscience in an attempt to understand the science behind human social interaction. A lot of the ideas in the book I was already familiar with, but - for me- it was the first time I learnt how the brain controls our social nature (which was interesting). The book was definitely for beginners and wouldn't be suitable for anyone after in-depth analysis but it was still a decent read. Clear and covers a variety of material without oversimplifying (much). The central thesis is that as human digestive systems, intelligence and technology, and lastly climate, led to lifestyle changes from small nomadic tribes to larger settled groups, there was selection for traits facilitating coexistence, and thus we became self-domesticating. It's fairly convincing, although much of the book concerns peripheral issues and there's not much new here for anyone with basic knowledge in the areas ar Clear and covers a variety of material without oversimplifying (much). An accessible, digestible account of a complicated and timely subject. Exactly what a Pelican should be. In dit kleine boekje schetst Bruce Hood, pyscholoog (geweest?) aan de universiteiten van Cambridge en Harvard en tegenwoordig Director of the Cognitive Development Centre van de universiteit van Liverpool, het beeld over onze hersenen, over hoe domesticatie z'n invloed heeft (gehad) op ons doen en laten. Hij begint met de vergelijking van de hersenen van onze voorouders met de onze, hoe die eerste groter waren en de onze kleiner. Dat zou o.a. te maken hebben met adaptatie, met het wegvallen van In dit kleine boekje schetst Bruce Hood, pyscholoog (geweest?) aan de universiteiten van Cambridge en Harvard en tegenwoordig Director of the Cognitive Development Centre van de universiteit van Liverpool, het beeld over onze hersenen, over hoe domesticatie z'n invloed heeft (gehad) op ons doen en laten. Hij begint met de vergelijking van de hersenen van onze voorouders met de onze, hoe die eerste groter waren en de onze kleiner. Dat zou o.a. te maken hebben met adaptatie, met het wegvallen van functies die we door de jaren heen niet meer nodig bleken te hebben. Maar ook omgevingsfactoren, voeding, taal, en meer spelen een rol. Ook het gedrag van baby's en kinderen wordt besproken, vooral dan in de context van met elkaar omgaan, delen, bezitten, handelingen/gedragingen/gezichtsuitdrukkingen/... overnemen van anderen (al dan niet volwassenen). Dit trekt hij dan door - niet altijd, soms moet je zelf die conclusie trekken - naar volwassenen. Hood heeft het bijvoorbeeld ook over mindreading, over hoe we soms "weten" wat of hoe een ander denkt, al dan niet gezichtsuitdrukkingen, lichaamstaal, enz. Ook liegen komt aan bod, vooral dan of je vasthoudt aan je eigen overtuiging of je laat leiden door de groep, ook al is de groep fout. Natuurlijk blijft het opvoedingsaspect niet onbesproken. Een goeie thuis blijft belangrijk, niet alleen voor de opvoeding, maar ook naar de toekomst toe. Bij de groep horen is iets wat we allemaal willen. De mens is een sociaal dier, ook al is er de behoefte om af en toe de eenzaamheid op te zoeken. En om bij die of die groep te behoren, kan men tot veel in staat zijn. Uitgesloten worden is een erge straf, een die te vaak onderschat wordt, omdat men de implicaties niet kan meten. De repercussies kunnen soms desastreus zijn. Hoods betoog is up-to-date, niet alleen omdat het in 2014 verscheen, maar omdat selfies, sociale media en het Internet in zijn huidige vorm ook aan bod komen. Ondanks dat het een introductie betreft, bevat dit boekje toch veel informatie en voorbeelden (ook over het gedrag van dieren) over hoe de mens zich in een gedomesticeerde omgeving gedraagt, hoe niet altijd de omgeving of de cultuur allesbepalend is. Er zit meer achter dan dat. Bepaalde kenmerken zouden aangeboren zijn, al van bij de start in onze genen ingebakken zitten. Het geheel wordt opgeleukt met tekeningen en foto's. The Domesticated Brain: A Pelican Introduction is zeer leesbaar (het is dan ook voor een breed publiek bedoeld), ook al gebruikte de heer Hood hier en daar wat technische woordenschat, die niet altijd uitgelegd wordt. Maar in de totaliteit is dit aandeel slechts triviaal. Like all Pelican Introduction books, Bruce Hood's The Domesticated Brain is targeted at a general audience. But that doesn't belie the fact that this accessible and well-written book presents an awful lot of cutting-edge information about the rapidly expanding understanding of the brain, consciousness, its evolution, and human nature as a domesticated social animal. 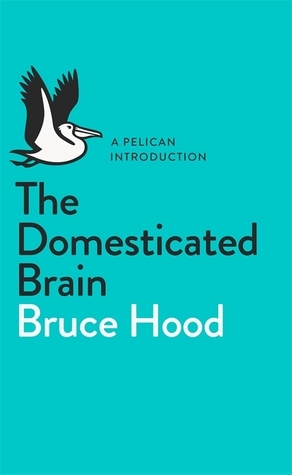 What initially drew me to examine this volume was a nagging question about the trade-offs we humans have made along the path to civ Like all Pelican Introduction books, Bruce Hood's The Domesticated Brain is targeted at a general audience. But that doesn't belie the fact that this accessible and well-written book presents an awful lot of cutting-edge information about the rapidly expanding understanding of the brain, consciousness, its evolution, and human nature as a domesticated social animal. What initially drew me to examine this volume was a nagging question about the trade-offs we humans have made along the path to civilization. Clearly we experience amazing benefits — not least of which is the miraculous ability that I can share what I think with you through the intermediation of Goodreads, the internet, the English language we share in common — because you and I have been domesticated; but these benefits have been purchased not without cost. Just prior to my discovery of Prof. Hood's brief survey of neuroscience, I had come across a lecture by Toby Hemenway where he lamented the loss of a way of life, the destruction of "the freeest people on earth," as just one cost of the eleven thousand year domestication program that began with the invention of agriculture. I usually don't write reviews about books, I simply can't find much to say about them. However, this time I was determined I'd write one, since I received this book in a giveaway. I used to think that books like this one can't be really light but in the same time gripping reading. In my mind they were meant to educate people although not as seriously as textbooks in schools. Yet I found Domesticated Brain funny and entertaining. There were many moments I had to force myself to put the book down so I usually don't write reviews about books, I simply can't find much to say about them. However, this time I was determined I'd write one, since I received this book in a giveaway. Отличная книга про то, как приобретение цивилизованности изменило человеческий мозг, выдвинув социальные связи в обществе между отдельными индивидуумами на самое приоритетное место, даже местами отодвинув физические потребности. Особо понравился эпилог про социальную революцию, которая происходит прямо сейчас. Found this fascinating on so many levels. I shake my head in wonder why more people don't read these types of books instead of gossip magazines. Entertaining, informing, thought provoking, educating. Ahhhh. excellent. An approachable read for ages 12+ to curious adults. Great book to read for leisure. Simple and intriguing. Could use some editing for grammar/typos/repetitive writing, but the information was mindblowing. Hood presents compelling arguments that reframe many psychological theories and principles in terms of evolutionary domestication and associated social changes. Absolutely brilliant. A great read for those who wish to know a little more about how our brains are just hard-wired to escape rationality. Would be a great book for someone looking for a readable overview of social psychology. Nicely written. I was born in Toronto, Canada, and my middle name is MacFarlane. This a legacy of my Scottish heritage on my father's side. My mother is Australian and has the very unusual first name of Loyale. I used to believe for many years that she had two sisters called Hope and Faith, but that was just my fertile imagination. Why Toronto I hear you ask. My father was a journalist and plied his art on variou I was born in Toronto, Canada, and my middle name is MacFarlane. This a legacy of my Scottish heritage on my father's side. My mother is Australian and has the very unusual first name of Loyale. I used to believe for many years that she had two sisters called Hope and Faith, but that was just my fertile imagination. Why Toronto I hear you ask. My father was a journalist and plied his art on various continents. By the time I had finally settled in Dundee, Scotland, at 8 years of age, I had already lived in Australia, New Zealand, and Canada. If you are wondering, I support Scotland during the Rugby World Cup. I have an older brother who was also born in Toronto, but he doesn't have a mid-Atlantic accent like I do. He is sensible. He is a lawyer. In Dundee, I went to school and then university where I studied psychology and socializing. I then went to Cambridge to conduct research on visual development in babies. Not because they are cute, but because their visual system is so interesting. I completed my Ph.D. in two years in 1991. That year I got married with a "Dr." in front of my name to my wife who is a real doctor and would not marry me until I was doctored. After a brief research period in London, we both set off to Boston, Massachusetts, to sample some U.S. academic life for a year. By the time we were ready to travel, we were now three, as my eldest daughter had been born. When my wife wasn't paying attention, I applied for and was given an associate professorship at Harvard. I interviewed without telling her. What was supposed to be just one year abroad in the United States turned into five. I do stuff like that all the time.